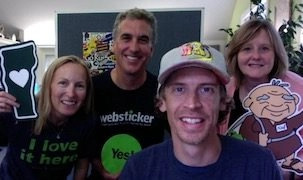 At Websticker we are in a unique position when it comes to donations for nonprofits. Our position allows us to not just donate money to an organization (and feed them for a few minutes), but to leverage donations into a low-cost promotional tool that can feed and grow an organization for years to come. The Freely Fund is supported by $2 from every order that comes through Websticker. The Fund is also supported by you, sticker enthusiasts and people who want to support charities on their own, but prefer to know their money is going directly towards promoting the cause, not overhead and administrative fees. All donations (over $5) to the Freely Fund receive a large pack of vinyl (outdoor durable) stickers. No two packs are alike and all will include positive fun messages as well as a few stickers from the organizations we support. We appreciate your help in saving the world… one sticker at a time! a larger donation to help the cause!